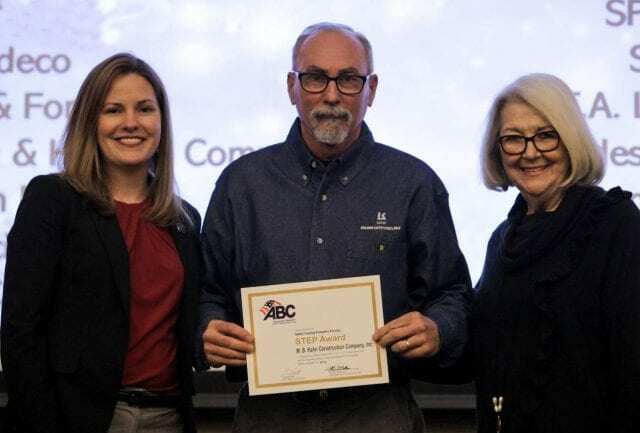 Daniel Wessinger, M. B. Kahn’s Corporate Safety Director, attended the recent ABC Carolinas Chapter STEP (Safety Training Evaluation Process) Program awards to accept the company’s Gold Achievement Certificate. Established in 1989 by the ABC National Environment, Health & Safety Committee, the STEP program was developed and written by contractors, for contractors. Thanks to our outstanding team members for building safety excellence! Daniel accepted the award from Emily Farr, Director, South Carolina Department of Labor at left, and Cherie Berry, Commissioner, North Carolina Department of Labor.